Kylo Ren is a very dangerous attacker with cooldown reset abilities. Let’s take a look at what he has to offer to your team. Basic Ability: Ragged Cut – Deal Physical damage to target enemy with a 55% chance to inflict Healing Immunity for 1 turn and a 75% chance to inflict Damage Over Time for 2 turns. 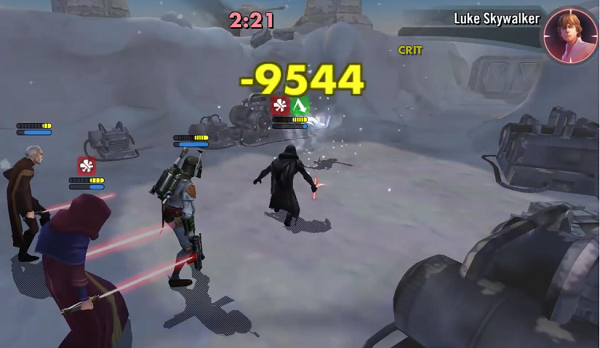 Unique Ability: Unstoppable – Kylo has a 45% chance to reset his cooldowns whenever he is damaged. Kylo Ren is a real menace. He can inflict both healing immunity and damage over time in his basic attack. His AoE damage hurts and he will gain retribution(counter) for a turn. His outrage hurts even more when he is under 50% health. He is quite tanky and can take a beating before going down. Because he needs to be focused, he has a high chance of resetting his cooldown and be able to use his skills again. 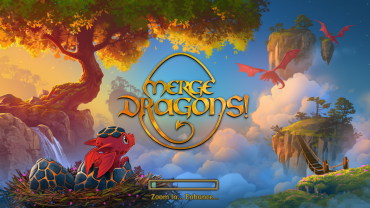 This is highly beneficial to your team because his skills do damage! He does have rather average speed though, so most of the time you should be able to burst him down. If not, you will be in big trouble. He also works really well in a first order team. Captain Phasma, Kylo Ren, First Order TIE pilot go really well together. Put in Darth Sidious and Poe Dameron and you have a very scary AoE/Burst team. He is farmable but it does take a while. I am not complaining though, he is one of the best characters EA has to offer. Verdict: Farm and max him for your First Order team. 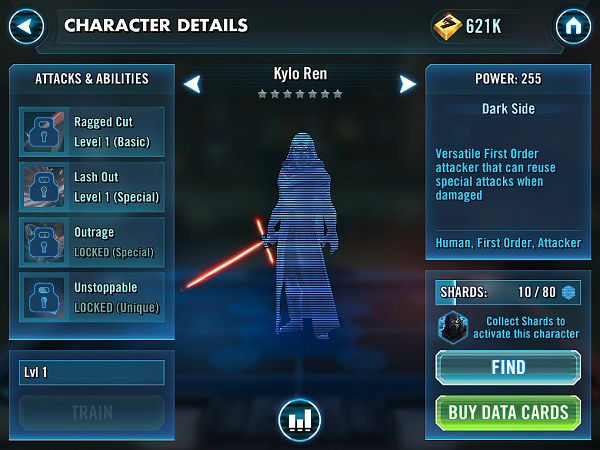 FYI, Kylo Ren is also farmable on Cantina 6C.